What Does It Mean To ‘Float’ a Carpet? Floating a carpet is one of the best ways to dry a carpet to prevent serious water damage. At AAA Flood, we have advanced drying methods for wet carpets and flooring after any amount of flooding in your home or business. Drying a carpet can be done many ways but generally our 22+ years of experience show us that floating a carpet is most important to that process. Floating a carpet is the technique that refers to putting industrial sized fans under the carpet so that the moving air will dry out the wetness and moisture. it is important that the edges of the carpet stay down on the ground so that the process is most effective. The fan will blow air under the carpet causing it to ‘float’. The center of the carpet will come off the ground. This can require the use of multiple fans and blowers to get the carpet off the ground. 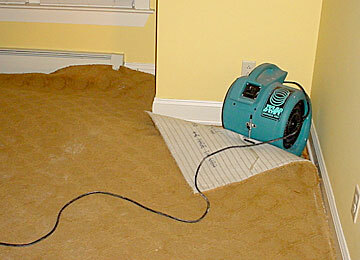 You have to leave the fans and blowers in place for an extended amount of time to completely dry out the carpet. The water removal aspect is key. You need to remove all water from the carpet and the carpet pad to prevent serious water damage. If the wet carpet pad is not dried properly it can result in bacteria growth which causes a wet carpet smell or odor. Failure to properly dry a carpet can cause mold growth, which will require repair or replacement of the carpet in addition to mold remediation. This can cause weeks of demolition and reconstruction.